I felt it was important to log my overall experience of training in Thailand for this project to be the back up to the press release which I hope to be published. Photos and videos will also be part of this to display the experience more. The experience of training and being there overall was a very powerful one I won't ever forget. From going there with the viewpoint of conducting training along the lines of what I worked with when supporting clients with brain injuries I realised more and more how much more complex this all was on a whole political level. I realised how whereas great training and having volunteers set up was one wonderful thing; that what in fact we were looking at and really being a part of was a whole process of trying to engineer social and political movement. I was astounded when I was there for just those few days the stories that people brought to me just from within the training. Just the few people who spoke with me all had huge stories. One man really keen to volunteer said his case had been closed by UNHCR (United Nations High Commission for Refugees) and that they wanted him to go back to Pakistan. He personally lives in fear of being detained now each day but is still heroically giving his time to volunteer to support others worse off than him. Two of his close friends were also in the exact same situation. These people all had good respectable jobs in Pakistan. One person was a nurse, one worked as an office secretary in a school. Two others who spoke to me were deeply concerned about their children who couldn't go to school. 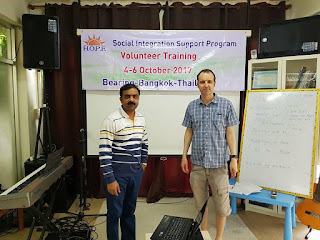 The charity governing this project (HOPE worldwide Pakistan) are also making steps to support the children in their own homes through home based education while they bide their time in Thailand. I thought constantly about how if these people were white English speaking New Zealanders they would likely be living happy comfortable lives. During the actual teaching of the course there were issues with people being quite late and it became apparent that this was due to leaving at a time when they would be less likely to be pinpointed by authorities. 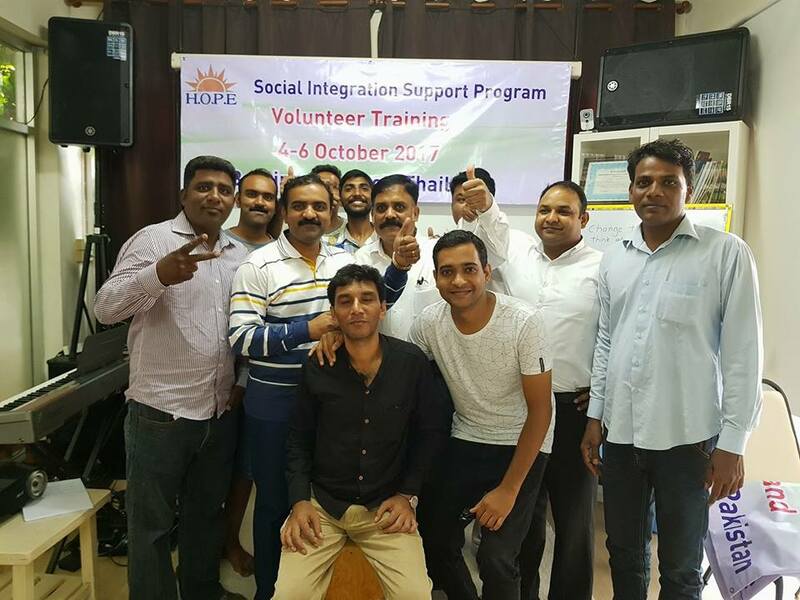 The volunteers were a mixture of people all of whom had been through the process of being refugees but had just found their feet a little bit more than those they were hoping to help through the project. These people were being real heroes and again it hit home for me just how on the fringes and discarded refugees are. It put more context to my proud volunteer counselling work I used to do. Being a white English speaking guy really is the most privileged life. The lesson I keep learning is don't be guilty about it but be aware of it and do your best to work to make things fairer. 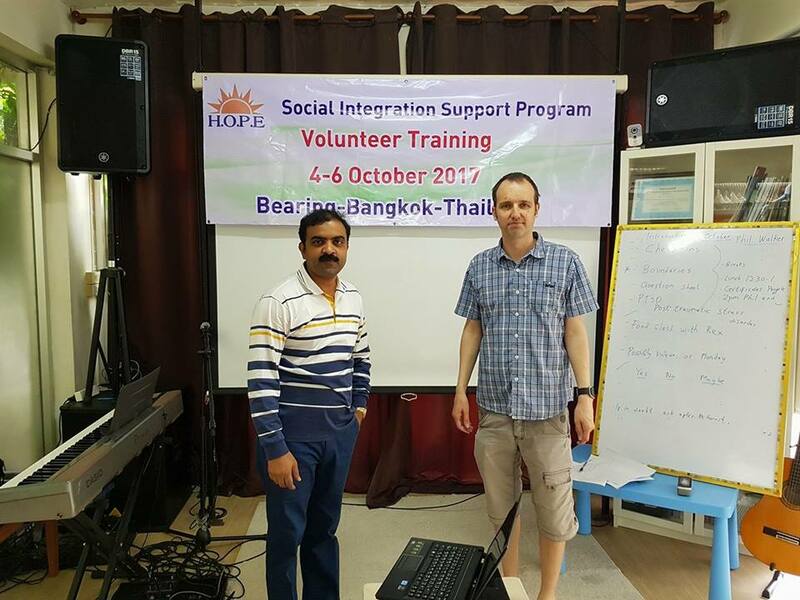 The training was interpreted as I spoke by the director of HOPE WORLDWIDE PAKISTAN (Malik) into Urdu for our volunteers. It meant speaking quite slowly throughout. The volunteers were not necessarily of an educated kind of background (some were) so it was important to just teach the main principles to make a start. What I felt were most important were to teach about 'empathy' 'boundaries' 'post traumatic stress' and the general process we will follow. As I taught I realised what a big task this was. Some of these families may not have enough to eat as well as living in their constant fear of being detained. I realised how a lot of the process of visiting these families may actually turn into gaining more evidence of what it is we are in fact not able to do and then to bring this back in terms of their reports from the sessions to present as more evidence to appeal for some kind of change. Volunteers asked me what we would do if we weren't able to supply what they needed. The only honest answers I could give was that HOPE would have some allocation of food which we wished to increase through greater awareness of the program and that in cases where we weren't able to give anything to them that it would be okay to just leave if they wanted and report this back again to build greater awareness of what is going on. The key change needed is for Thailand to accept the UN protocol regarding refugees. Here is a petition I'd urge you to sign and also to read through for more background information. This made me wonder about on a purely religious level how widely known this situation for Christian refugees in Thailand actually was. I felt it was really important to make this more widely known to churches to see if further adopting of these families is possible or any kind of donations at least. During the training I was able to just visit one family. This family was typical of the way these people are living right now. There were 5 people in a room in an apartment style complex. The elder man of the family was devastated that his wife was in detention. It would take $2000 to release her. He said he cried each night for her. I was able to relate this experience back to the training as an example of whereas I unfortunately could not give the person what I wanted that I hoped through being there for him to talk and be with him in his pain that it could have made him feel less alone. I felt though this was a clear example of the kind of issues we were facing whereas this supportive help is all well and good but what we need is a social and political change. I said that through these type of situations the whole process of feeding back not just what they did as volunteers but also what they were unable to do would at the very least bring more into light the nature of what is going on to ignite more potential change. The actual psycho social initiative will start very soon with 2 volunteers and will be overlooked by Malik and myself for the time being. It is hoped that more funding will make more volunteers and also professionals to take over our roles. I wish to personally bring as much awareness to this situation as possible to do all I can to create change for these vulnerable people who are worthy of a much greater level of compassion from the world that they are currently getting. I feel this is possible. For the project itself the biggest challenge is for the volunteers to be as equipped as possible and to feel relaxed and like they can do a good job to help and support. It is hoped that further funding and therefore training will become available. HOPE is currently searching for more funding so a further initiative can be started in 6 months time. There is a story now below from one of the people who gave their permission to share. Please have in mind that it is a harrowing story and one also that is not untypical of what these people are going through or have been through. For the purpose of this blog I have adapted the somewhat broken English into greater clarity. 'I came to Thailand with my family in 2013 and we have status as refugees. My family consists of my wife and myself and our four children. Before this time I was in Pakistan where I was an eyewitness to 7 Christian people being burned alive due to blasphemy. I filed a 'First Information Report' and because of this I was arrested and tortured along with my brother. I was then released on bail and sent to an area called 'Toba Tek Singh'. I was continuously threatened and a false complaint was also made against me at which stage we fled to Thailand. Again to reiterate this example is by no means out of the ordinary. These are just regular decent working people. I feel the harrowing nature of this almost makes us want to look away but it's so important that we see what is going on and don't sweep it under the carpet as we have been doing. Below are a couple of pictures. One is of Malik and myself. The other is of the team of volunteers. I urge you to do all you can to make this more public and do anything you can to help or to share any ideas.